I’ve only recently begun wearing knee-high and thigh-high socks, but I’ve gotten completely addicted to getting these socks in all different colours and patterns. Now this recent etsy find though has got to be the cutest I’ve come across! Tattoo socks! How cute are these? There are a couple of different designs available (check out the esty store for the others), I featured my favourites here. The socks are available in 4 different body colour shades (ultra pale, light mocha, deep mocha, cafe latte) and white. 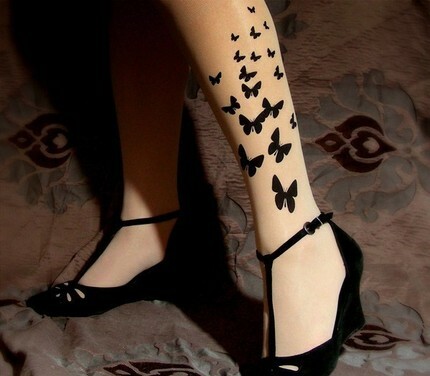 The design is printed in black on one sock; you get one printed sock and a blank sock to create an asymmetrical look. There are two sizes/lengths for sale: knee-high socks for $13 and thigh-high socks for $18. Shipping is only $2.80 per order.